Right off the bat, I'll say this. 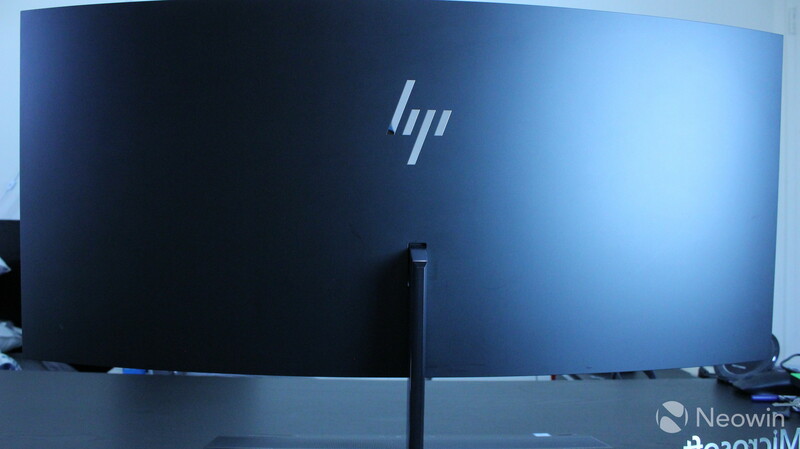 HP's 34-inch EliteOne 1000 G1 all-in-one Windows 10 PC is awesome. The curved widescreen display gives the user a ton of screen real estate, and in many ways, it beats a multi-monitor setup. HP's Elite features like PhoneWise improve the experience as well. 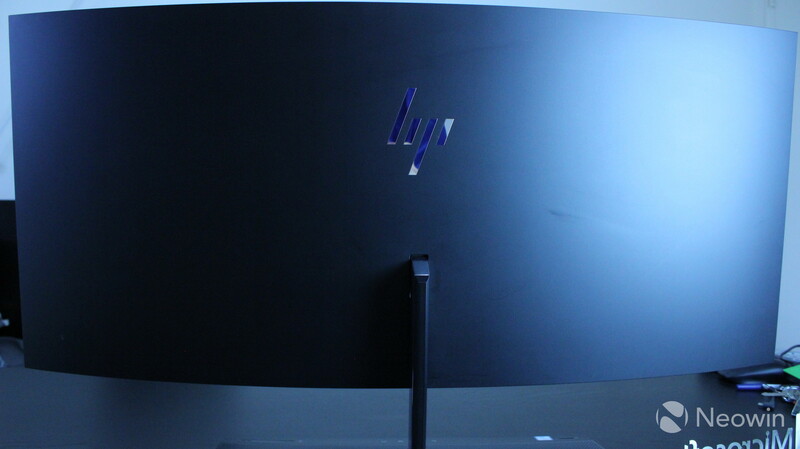 Just like all of HP's Elite devices, this is a premium business PC. Consumers are going to want to look elsewhere, but I'll try to cover all bases in this review. It's been a really long time since I've used an all-in-one PC. Normally, I use a tower that's connected to two monitors, external speakers, a webcam, and various other peripherals. I forgot just how convenient it is to have a PC that has all of those things built into it. 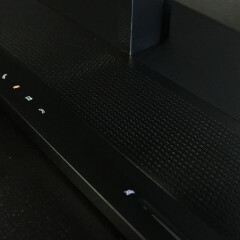 Just plug the EliteOne 1000 into a power source, and it's good to go. It's also a really nice-looking machine. 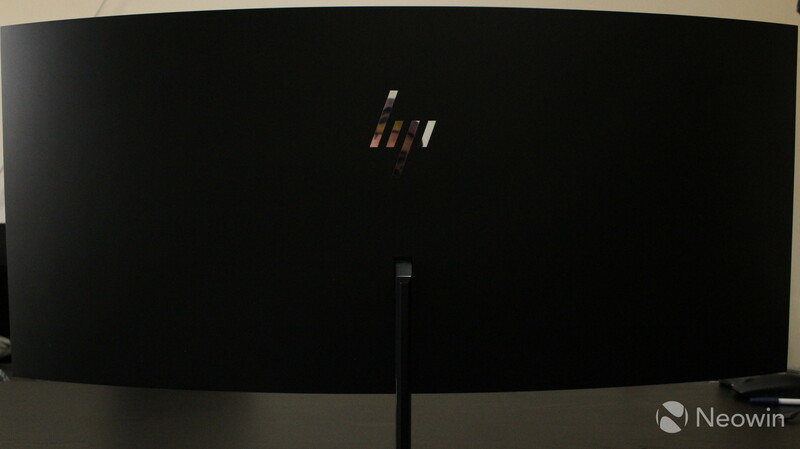 The black wedge-shaped base connects to the monitor via a chrome-colored arm, which makes the EliteOne really pleasant to look at. 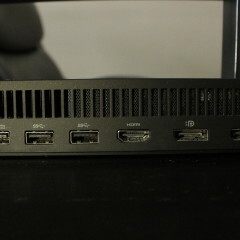 The rear of the base is where most of the ports are located. 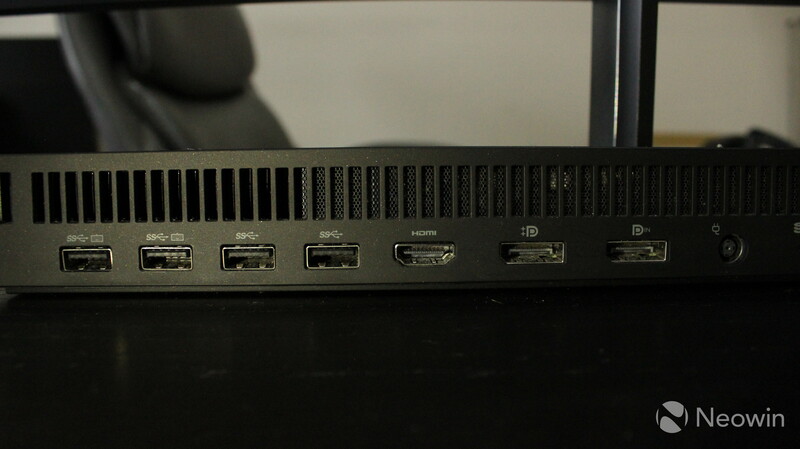 Over there are four USB 3.1 Gen 1 Type-A ports, which supports speeds of up to 5Gbps. 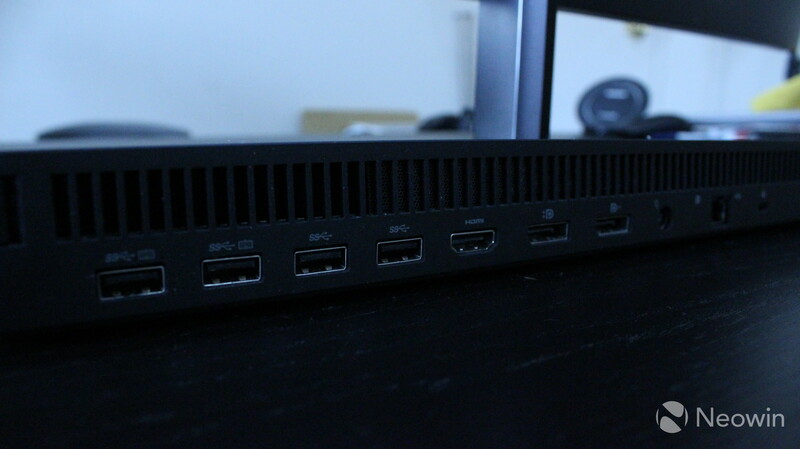 There's also both DisplayPort in and DisplayPort out ports, which means that you can always use this machine as a monitor if you want to. 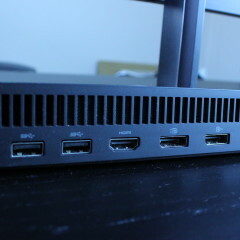 On the right side, toward the rear, are ports that you can use for plugging in peripherals that aren't always connected. 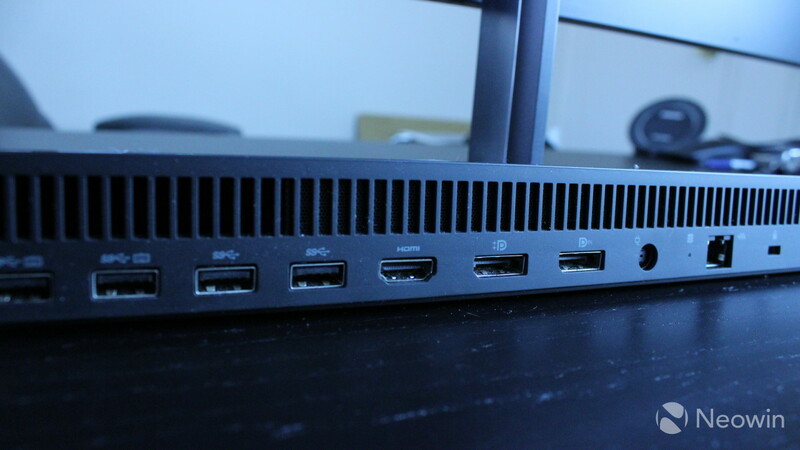 Placed there are a USB 3.1 Gen 1 Type-A port, USB 3.1 Gen 1 Type-C, and a 3.5mm audio input/output jack. The good news is that the USB Type-A port is always on, so you can use it to charge your devices even when it's not in use. The bad news about that setup is the 3.5mm audio jack placement. Frankly, it's a horrible spot to plug headphones into a PC. Being all the way toward the rear, many headphones aren't long enough to wear comfortably while using it. This device is designed with collaboration in mind, so obviously that jack has other uses, but does anyone not listen to music while at work? 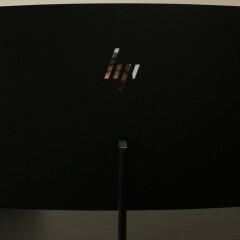 Speaking of listening to music, the Bang & Olufsen speakers are in the front, and they sound awesome. They're pretty loud too, and you shouldn't have any trouble using the machine for a presentation without any external speakers. There's also a volume slider built into the base, which frankly, is pretty cool. 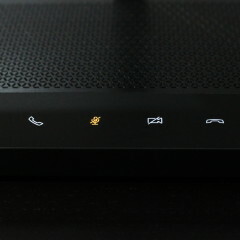 You can tap next to it to mute the audio, and there are also buttons for controlling Skype calls and such. What's really cool about the design though, is that the EliteOne 1000 G1 is really easy to take apart. 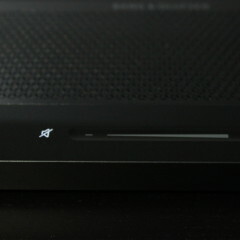 There are two covers on the base, and the rear one can be removed by pressing buttons on the sides. Once those are removed, you can easily swap out the internals. But that's not all, because you can even replace the display and the webcam, so if you bought the 23.8-inch EliteOne and want that 34-inch curved display, you can do that. 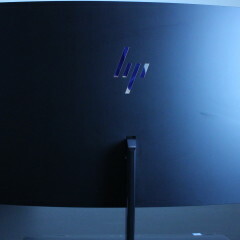 As usual, HP's display is bright, the colors are vibrant, and so on. It's a really pretty display. But that's not really the highlight of this screen; it's the size and form factor. 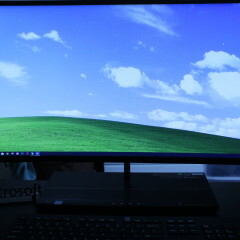 This model comes with a 34-inch curved 3440x1440 LCD. 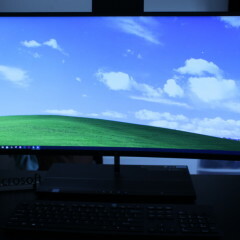 That gives it an aspect ratio of 21.5:9, which is really wide. There's no touch, which is fine for something like this. In other words, there's a ton of screen real estate, and I found that there are pros and cons to this. The thing that really bothered me isn't a limitation of the device; instead, it's a limitation of Windows. You can only snap windows side-by-side or in the corners. 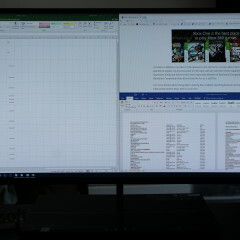 There's no way to fit three or four apps side-by-side, similar to what I'd normally do with my dual-monitor setup. On the other hand though, it's really cool when there are two apps side-by-side, and each one almost gets as much space as it would on a normal display. Webpages are typically scaled down when snapped to the side, but not on a monitor as wide as this one. And while I personally do most of my work in the browser, obviously the potential is even greater when you use this with different apps. You can keep a video call in one corner of the screen, review a referenced document in another corner, and take notes on the other side. In short, productivity potential on a screen like this is incredible. 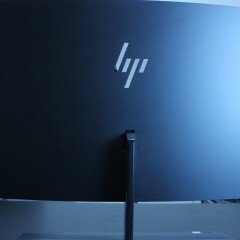 As always, HP is packing some cool business features. It's newest one is called PhoneWise, which allows you to send and receive text messages from your PC, and make and receive calls. For all intents and purposes, it's a great idea, and I think that it works as well as it can, at least with iOS, which is what I tested it with. Sending a message takes about 10 seconds, because it actually has to unlock your phone, launch the PhoneWise app, and send a text message through there. This is possible because you need to input your phone's passcode into the app. Android should work a bit better, as Android phones just work better with third-party devices like that, and you should be able to pair the EliteOne as a trusted device. The app does have its shortcomings though. For one thing, you can't send or receive images. If someone sends you one, you'll get a notification that you received an image, but you'll have to open your phone to see it. While it does sync your contacts, it doesn't sync your messages. You'll be able to see the messages that you send and receive throughout the day, but even those will be gone the next time you turn on the PC. All of these issues are reasonable, in my opinion, especially since the app is in beta. What really annoys me is that it gives me a notification when my iPhone disconnects and reconnects via the Bluetooth connection. This doesn't necessarily only happen when I'm out of range, but also when my phone is simply sitting on the desk. It just disconnects for a second or two, and then reconnects. I understand that this happens occasionally, but notifications for this get annoying and shouldn't be on by default. 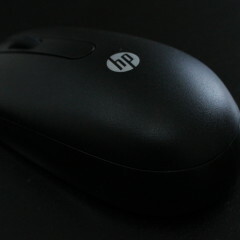 But PhoneWise isn't the only HP Elite software that's included. There's also Sure Click, which provides a secure web browsing experience. 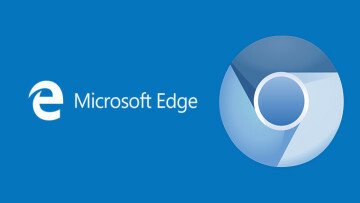 This is a web browser that's based on Chromium, and as you'd expect, it works just like Chrome. There's also a Sure Click Dashboard that shows you your status and various options. Sure Start is HP's solution for protecting the BIOS, as it checks it against a master copy, and if it's been corrupted, it fixes it. As was the case on the EliteBook 1040, the SupportAssistant tool doesn't actually work for installing firmware and drivers. Instead, you'll have to use the SoftPaq Download Manager. 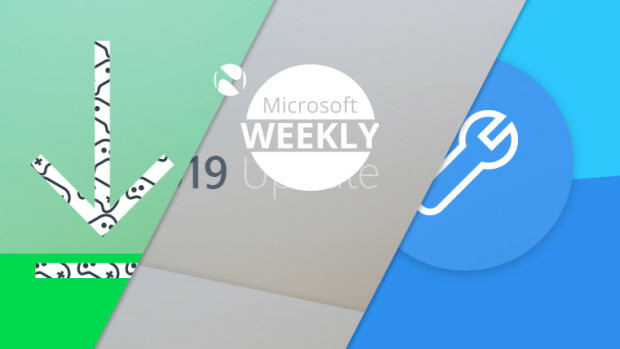 Finally, the one thing I didn't care for was that it doesn't support WorkWise, a feature that shipped with the EliteBook 1030 x360 and alerted you on your phone if your PC was tampered with, among other things. This was a really great feature, and it seems to have been abandoned in favor of PhoneWise. Both are separate apps that have to pair with your phone via Bluetooth, so presumably, they conflict with each other. It's unclear why the PhoneWise functionality wasn't just built into the WorkWise app, as that would make sense. The HP EliteOne 1000 G1 uses both facial recognition and a fingerprint sensor for Windows Hello, which is pretty great. 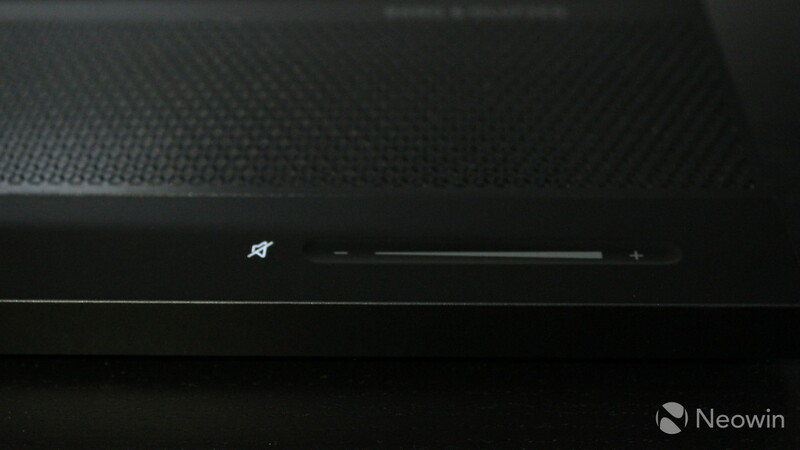 The fingerprint sensor is placed on the right of the base, and the IR camera is inside of the hidden webcam module. 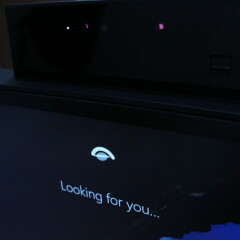 Yes, the webcam is hidden on the EliteOne, and this is pretty cool. 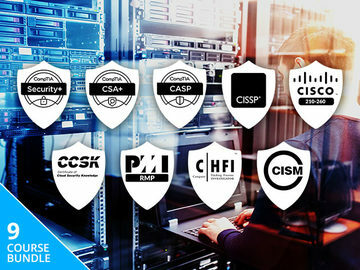 If you've been paying attention to the PC market as of late, built-in privacy guards are becoming quite popular, as we've seen from Huawei's new MateBook X Pro and Lenovo's new ThinkPads. 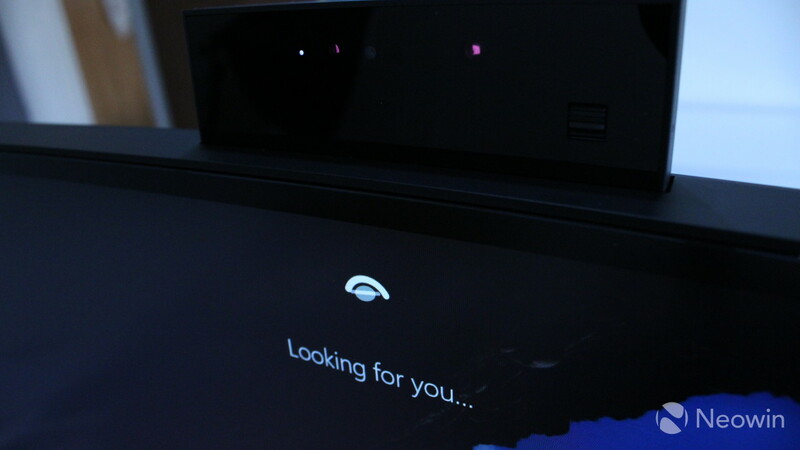 The entire webcam module can stay inside of the device, and pressing the top makes it pop up. If you're the type to keep it hidden most of the time, the additional fingerprint sensor might come in handy. Personally, I almost never used the fingerprint sensor. 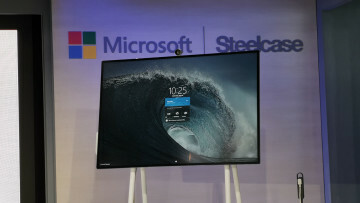 The Windows Hello camera is quite good, and I never had a problem with speed or accuracy as I've had on other devices. But I do like the idea of having a hidden camera. I'll often use the feature when I'm on briefing calls with companies, just in case I accidentally hit the button to turn it on and they can see how messy my office is. 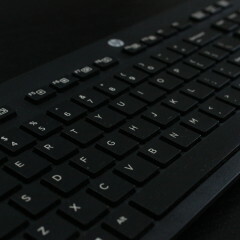 The HP EliteOne 1000 G1 comes with a keyboard and mouse. Both are wireless devices that connect through a single USB dongle. I'm actually not a fan of this method, because it forces the user to use both peripherals, or if you only use one, the other is completely wasted. Both of them are pretty basic, not offering more or less than you need. I'm not a fan of the keyboard though. I found the keys to be a little too resistant, which is kind of funny considering that my colleagues make fun of me for being such a hard typist. It's not really a big deal, and I did use it for the first few weeks. 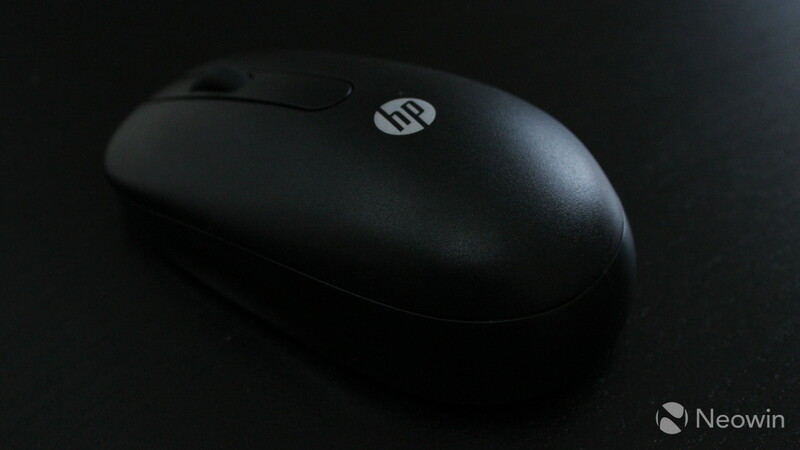 Unfortunately, when I did switch back to my usual Modern Keyboard with Fingerprint ID, I had to ditch the mouse in favor of my usual Microsoft Sculpt Mouse. This is a pretty minor part of the review. After all, pretty much every business has extra keyboards and mice lying around, so if an employee starts complaining about the keyboard on their machine, there are probably some options lying around. If not, they aren't the most expensive peripherals in the world, and you can just get the ones that you prefer. 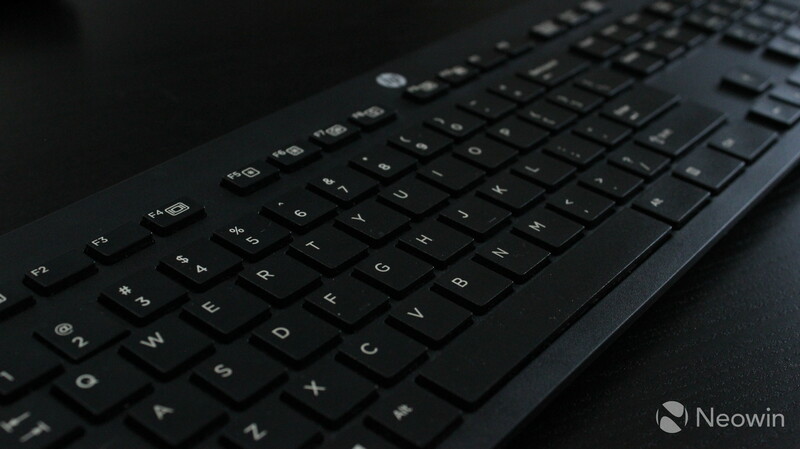 In my opinion, a good keyboard and mouse are critical to a comfortable experience when using a PC. The good thing about a desktop PC is that you have a plethora of options. But I did want to point out the one-dongle approach. The major pro to this is that it saves you a USB port, but you can't use both peripherals with different devices. 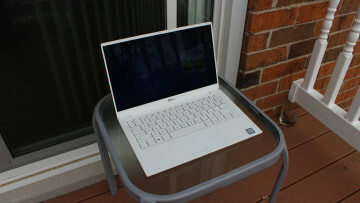 The model that I was sent includes an Intel Core i5-7600 CPU, 8GB RAM, and 256GB of internal storage. To be clear, for most uses, this is just fine, although I did keep a USB HDD hooked up to it for additional storage. But while this might be fine for most users, I am not most users. Naturally, I used this for my regular workflow, which includes having about a dozen tabs in Chrome open at the same time, along with Skype, OneNote, and Slack. I often use Photoshop as well, and I did some video editing as well. But of course, I also tried gaming with it, so you can say that I used it for a full range of activities. First of all, serious gaming isn't happening. Yes, this is a business PC, so it's probably OK, but many employees are using the same device for all of their activities, including work and play. 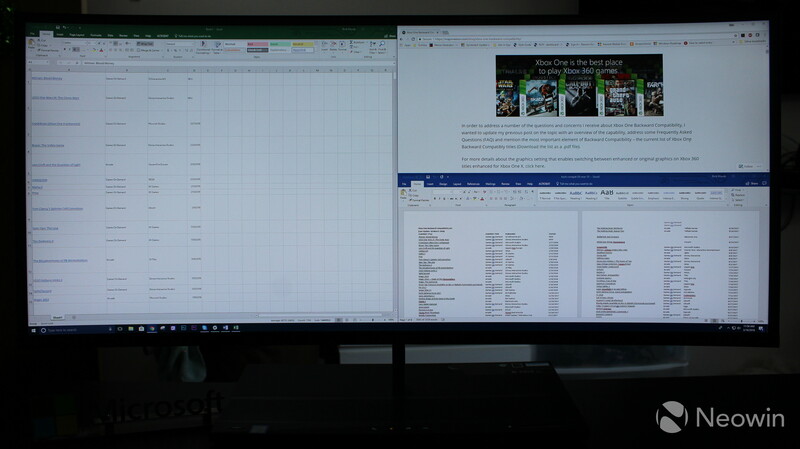 If your boss bought you an EliteOne 1000 G1 for your home office, don't plan on playing Gears of War, at least at the full resolution. One option, however, is to hook up a gaming rig to the EliteOne and use it as an external monitor. You can also use HP's Accelerator to jack up the GPU. 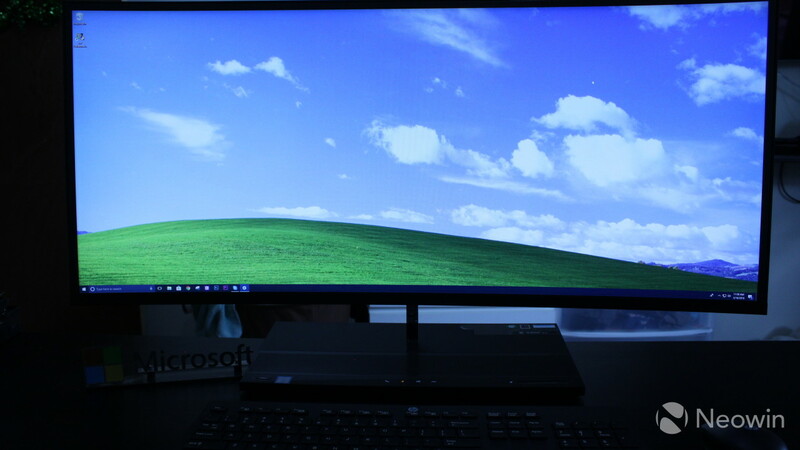 But unfortunately, the EliteOne 1000 does not have a dedicated GPU, so it just uses Intel's integrated graphics. This means that graphics memory is shared with the system memory, so serious gaming and heavy video editing isn't going to go well. You can edit a 1080p 30fps video in Premiere Pro, but if you go higher than that, rendering times are going to be pretty long. Also, to be clear about gaming, you can run games, but high-performance titles like Gears of War: Ultimate Edition will have to be scaled down to something like 720p, and will just crash if you set it to the screen's full resolution. However, if you play a game like Cuphead, or even Forza Motorsport 7, you'll be in pretty good shape. The point is that if you want to do something that's really GPU-intensive, you'll struggle on the EliteOne. Otherwise, it's smooth sailing. 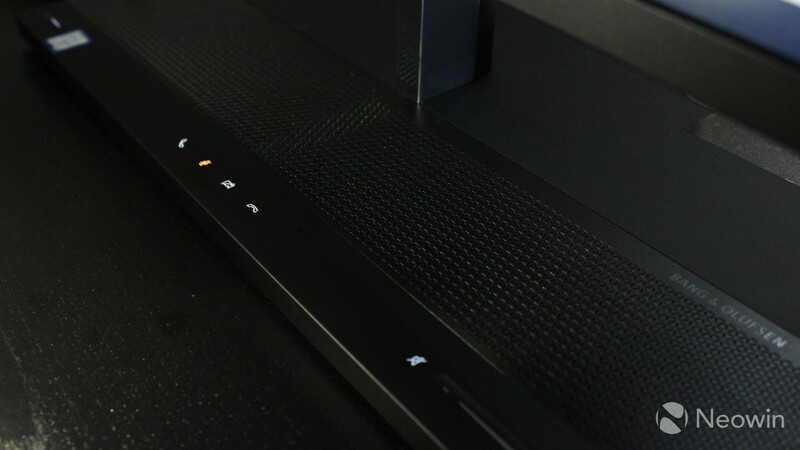 Other than a few issues that I've noted throughout this review, I have nothing to complain about with the EliteOne 1000. It's a wonderful, fast machine. For benchmarks, I used PCMark 8, which provides three tests: Home, Creative, and Work. 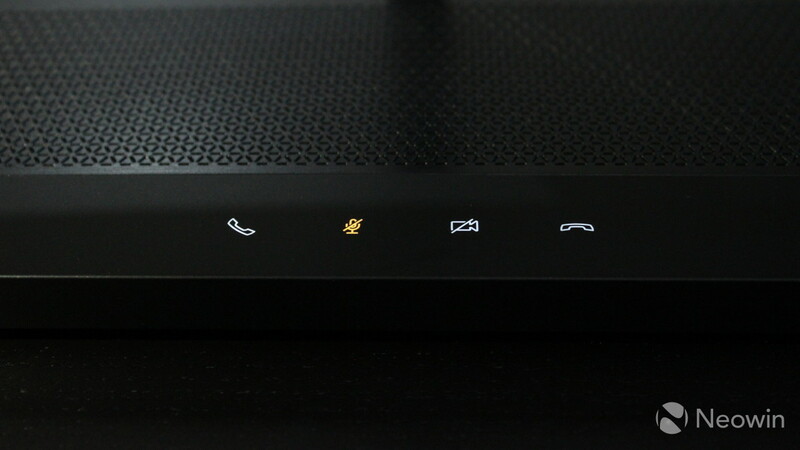 First up is Home, which tests common tasks like video chat, casual gaming, web browsing, and so on. As you can see, it scored pretty well for casual tasks. The next test is Creative, which checks more GPU-intensive tasks like video editing, serious gaming, and more. The EliteOne also scored pretty well on the Creative test, but it's not as good as something that you'd use for video editing or gaming. This isn't a mark against the PC at all, but it's best to be aware of the device's strengths and weaknesses. The last test is Work, and that tests productivity-related tasks like spreadsheets, writing, video chat, and more. Being that the EliteOne 1000 G1 is built for work, it should be no surprise that this is where it shines. Indeed, it's an excellent productivity machine. I'm not going to pretend that the HP EliteOne 1000 G1 is a perfect Windows 10 PC. I'd say that my biggest issue with it was the headphone jack placement. There are also some annoyances with PhoneWise - which is an overall great product and should get better - and the lack of a dedicated GPU means that it can't perform as broad of a range of tasks that I need it to. But man, that screen is just awesome. 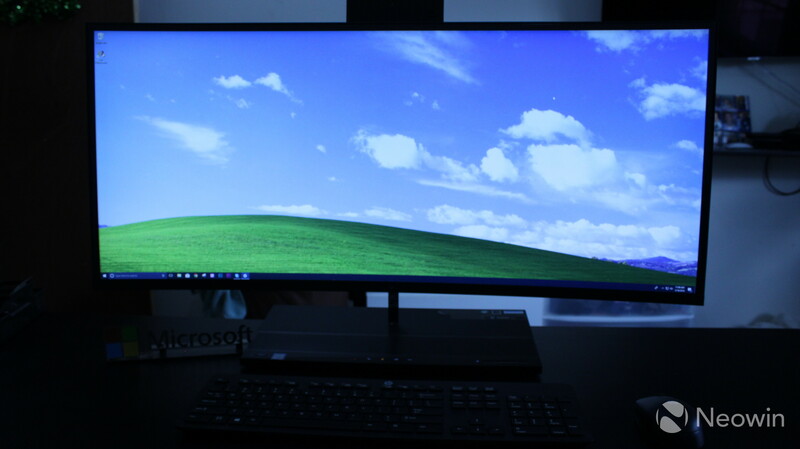 The ultra-wide aspect ratio provides a cleaner feeling experience than two monitors. I'd absolutely love to use something like this all the time if Microsoft ever lets users snap three or more windows side-by-side. 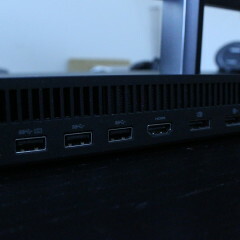 And the all-in-one form factor is great, providing an experience with as few cables as possible. The device is beautiful, and contains handy buttons in the base like a slider for volume, and that base is easy to take apart too. Being that the all-in-one PC is so easy to take apart, you can most certainly upgrade the internals, and you can swap out the display as well. It's pretty cool. The most important thing to remember is that this machine is great for productivity. You can fit two full-size windows next to each other, which allows you to work with them easier. Just don't plan on doing any heavy video editing on it. If you're not, then this is an awesome machine for its price.